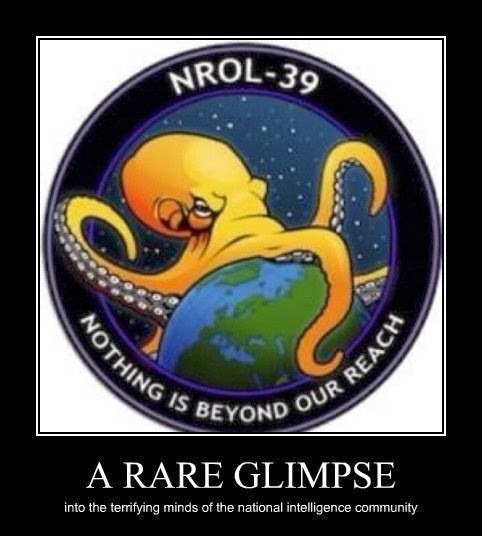 This is a real logo placed on a real spy satellite by the National Reconnaissance Organization, one of the many organizations overseen by James Clapper (that guy who lied to Congress about government spying), the Director of National Intelligence. Apparently the Office of the Directory of National Intelligence live-tweeted the launch of a classified spy satellite (OpSec?) emblazoned with this logo. Let me just say, if your organization identifies with a giant space Kracken, there's something wrong with you people.